Memorial services are scheduled for 11 a.m. Wednesday, Dec. 23, at Hermosa Church of Christ for Chad Everett Hall of Artesia. Hall, 42, passed away Thursday, Dec. 17, 2015, in Lubbock, Texas. Don Canada will officiate at the services. Cremation has taken place under the direction of Terpening & Son Mortuary. Chad was born Jan. 20, 1973, in Las Cruces, the son of Bobby K. Hall and Janet (Cothern) Hall. He came to Artesia in May 2009 from Dallas, Texas. He was the office manager at Critter Care. 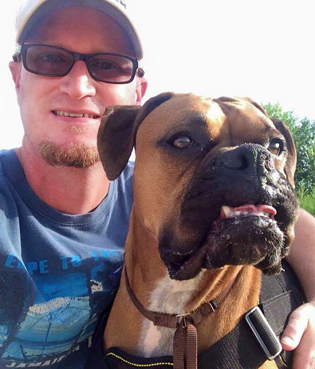 He had a strong love for dogs and was an active member of several Boxer rescue organizations. He also loved to garden and grow things. Survivors include his parents, Bob and Janet Hall, of Artesia; sister Crystal Baca of Stephenville, Texas; and nephew Caden Cooper Baca.